Two days to thread the loom with lots of crossed threads which I think are all fixed by the end of this sample. I have to revisit the sett as I think too much of the white weft is showing. Every alternate warp thread is an olive green and its not showing at all. Conclusion - warp threads should be of equal strength of hue. My aim is to find a treadling which I like for fabric for a jacket or tunic top or some such. Any of these is suitable for tea towels but not what I was after. The middle wavey line uses 5 end advancing treadling and it looked like blotches of colour on the original draft on the computer screen. 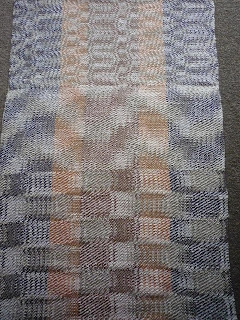 The top sample used a tie up with quite a bit of tabby and of course it weaves as basket weave on an interleaved threading. 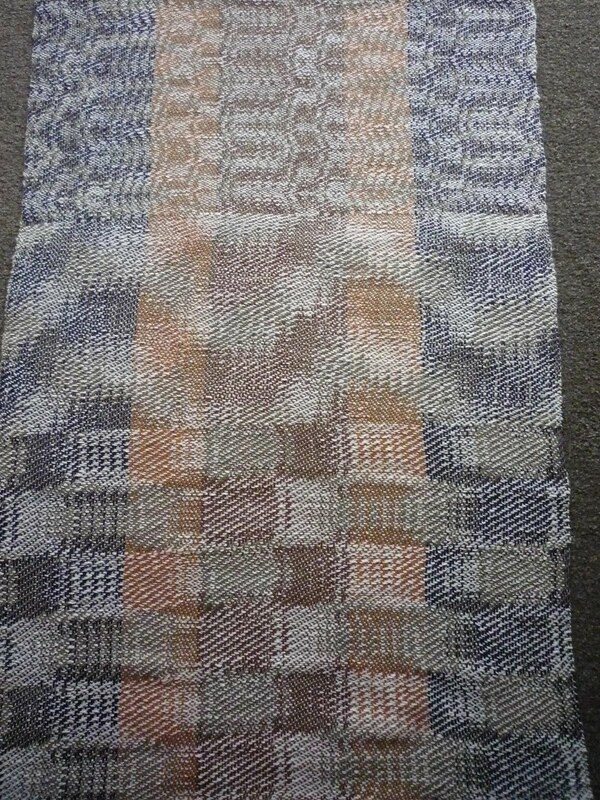 The patterns would show clearer if I hadn't put stripes in the warp. Anyone any suggestions.